The National Science Foundation (NSF) has awarded a three-year, $992,000 grant to UC Santa Cruz to fund an innovative research project to help passengers with special needs use public transit safely and confidently. 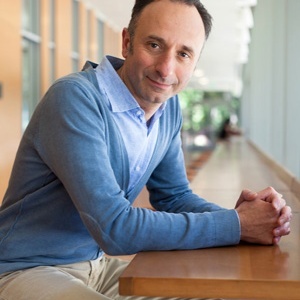 Principal investigator Roberto Manduchi, a professor of computer engineering at UCSC's Baskin School of Engineering, said the project addresses the needs of a large community of people who rely on public transportation for independent mobility, yet face serious difficulties in using it. "For someone with poor vision or blindness, or with some level of cognitive impairment, and for many senior citizens, taking a bus on an unfamiliar route can be a real challenge and a source of anxiety," Manduchi said. "Our system could make public transit easier to use for everybody." Difficulties in using public transit often involve access to the relevant information, such as which bus to get on, which platform to wait on for a train, when to exit the bus or train, and how to negotiate a transfer. Manduchi's team will develop and test a system called RouteMe2 that will provide users with continuous, context-aware information, notifications, and warnings designed to guide them through their trip from start to finish. The RouteMe2 service will be based on an extensive infrastructure that includes miniaturized transmitters (called iBeacons) placed inside buses and trains and at bus stops, train platforms, and transit hubs; sensors in the user's smartphone; and a cloud service that receives data from the user's smartphone and from transit agencies. The user, or an authorized person such as a family member or caretaker, can register a trip in advance using an online system similar to familiar trip schedulers such as Google Maps. During the trip, the passenger receives information to help ensure that they are waiting at the right location, entering the right bus or train, and exiting at the right stop. Meanwhile, an authorized family member or assistant can monitor the trip remotely and receive warnings if an unexpected situation arises. Manduchi has worked on a variety of research projects to develop assistive technologies for people with disabilities. For this project, he will be working with colleagues in several different departments at UC Santa Cruz. Computer scientist Ethan Miller, the Symantec Professor of Storage and Security, will lead the development of cloud services for RouteMe2. Sri Kurniawan, professor of computational media and computer engineering, is an expert on human-computer interaction and will lead the design of an accessible interface and conduct focus groups and user studies. Adam Millard-Ball, assistant professor of environmental studies, is an expert on transportation policy and will provide input based on his experience in transportation planning. "Public transportation along the Central Coast is a vital link for connecting people to school, jobs, health care, family and friends, restaurants, shops, and so much more," said Congressman Sam Farr. "This federal research grant from the National Science Foundation will explore how to expand access to public transportation, especially for the disabled and senior citizen communities, which will make the Central Coast more livable. UCSC has long served our community with important research and I’m thrilled to see federal funding headed to UCSC." The UC Santa Cruz team will be working with several regional partners to develop and test the service. To get input from potential users of the system, the researchers will work with the Vista Center for the Blind and Visually Impaired in Palo Alto. 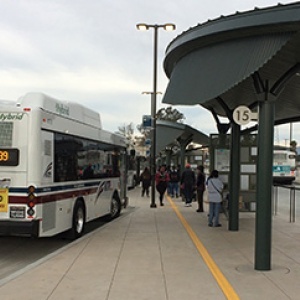 The team is partnering with the Santa Clara Valley Transportation Authority (VTA) to deploy the iBeacon transmitters on buses and at bus stops, and Manduchi has been in touch with Caltrain in regard to deploying transmitters at train platforms and on trains. IBM Research will serve as the principal industrial partner for the project. Lead researcher Divyesh Jadav and his team from the IBM Research - Almaden in San Jose will bring expertise in cloud computing, systems analytics, and the internet of things. They will help design an iBeacon-based test bed infrastructure and a cloud back-end analytics system for RouteMe2. IBM will also provide the team access to its Watson cloud developer platform on BlueMix. "The confluence of mobile, cloud, and the internet of things has made possible unique advances for travel and transportation," Jadav said. "We're pleased to help develop new cognitive assistance capabilities while setting a solid example of how public-private partnerships can address such large-scale societal challenges." The RouteMe2 project builds on Manduchi's previous work on a Personal Travel Assistant, funded by the Transportation Research Board, which showed that accessible transit-related information can be extremely helpful for blind passengers using the bus system. Manduchi said the RouteMe2 service will be based on a more complex infrastructure to provide more functionalities for a wide range of users. Although the research test bed will not be available for general use, he is hopeful that it will lead to the eventual implementation of such a service. "This is a technical research project, but it addresses important issues," he said. "We want to make public transportation more accessible for everybody."